If you’d like to come with your equipment, take place on a pitch. 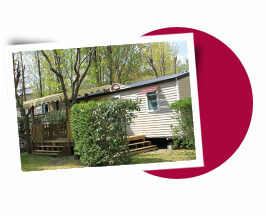 Starting from 17€ per night for 2 persons. Otherwise you have the choice in several mobile homes with 2 or 4 sleeping rooms. Starting from 50€ per night. For one family (maximum 6 people) + 1 car + 1 caravan (or 1 tent) OR one family + 1 camper. Free choice of arrival and departure day - Arrival after 2pm and departure before 12am. Dogs are not allowed in hight season (from 07/07 to 24/08/2018) • free choice of arrival and departure day. Deposit needed in order to make the booking: 25% + booking fees (with a minimum of 130 euros). The balance must be paid no later than 30 days before the start of the holiday. One vehicle per pitch. Coal barbecues are prohibited by the local laws. At the swimming pool: NO SHORTS ALLOWED – SWIMMING TRUNKS COMPULSORY. Les animaux ne sont pas acceptés dans les locations. Le linge de maison (Draps & Serviettes) n’est pas fourni. (Location de draps possible). Les matelas et les oreillers ne peuvent pas être utilisés sans draps ou taies. Les locations se louent à partir de 16 h et doivent être libérées au plus tard à 10 h.
1 seul véhicule par emplacement. Les barbecues au charbon de bois sont interdits par arrêté préfectoral. A la piscine : SHORTS INTERDITS – SLIP DE BAIN OU BOXER OBLIGATOIRE.